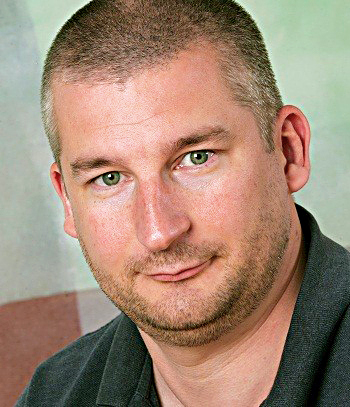 Today’s post is a profile of Guru investor James Montier, who appears in John Mauldin’s book Just One Thing. His chapter is called Thinking About Thinking. This article is part of our ‘Guru’ series – investor profiles of those who have succeeded in the markets, with takeaways for the private investor in the UK. We’ve met James before, as part of our Required Reading series. Amongst other books, James is the author of the Little Book of Behavioural Investing, which we covered in a series of posts here. He’s something of a specialist in the psychology of investing. James also appears in John Mauldin’s book Just One Thing. His chapter is called Thinking About Thinking. At the time of the chapter in John’s book, James was a global equity strategist for Dresdner, Kleinwort Wasserstein here in London. He now works for GMO. I thought twice about skipping this chapter, since it’s likely that we will have come across most of what James has to say already. But there could be something new here. And the requirement to boil his thesis down to a single chapter might help with our understanding. James starts by describing the two systems for thinking made famous by Daniel Kahneman. But James likes to call these the Spock and McCoy systems, after Star Trek. McCoy was irrepressibly human, forever allowing his emotions to rule the day. In contrast, Spock (half human, half Vulcan) was determined to suppress his emotions, letting logic drive his decisions. 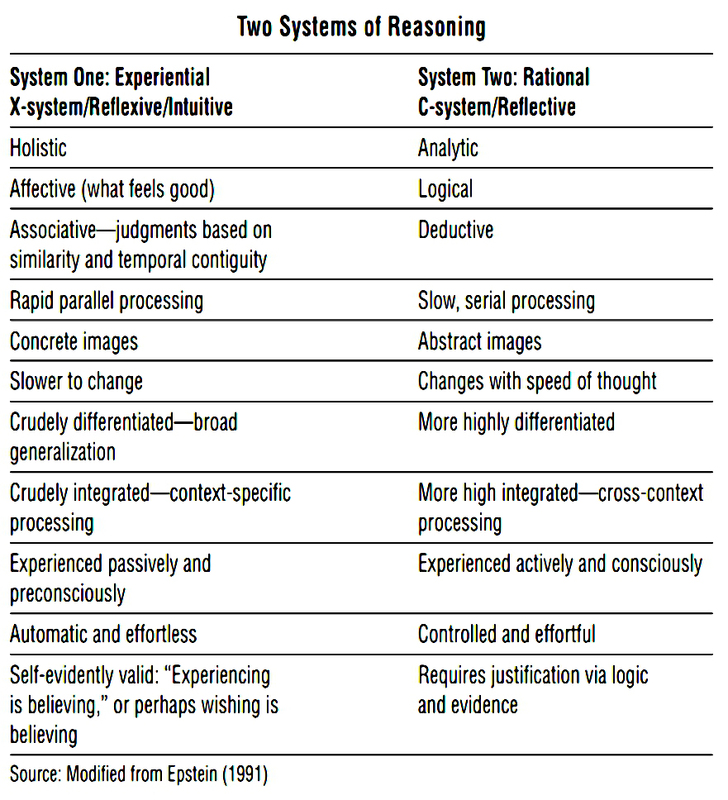 The other key thing to note is that System X (emotional, instinctive and fast thinking) is the default system. It takes effort to overrule emotion and wishful thinking with logic and evidence. System X is thought to be much older than System C, and more suited to our ancient needs (escaping a sabre-toothed tiger is the usual example given). The modern example used by James is a snake rearing up. You would jump back before checking whether it’s a dangerous species, or whether it’s behind a glass in the zoo. From a survival viewpoint, a false positive is a far better response than a false negative. We have a tendency to trust our initial emotional re- action and correct that initial view only subsequently, occasionally and effortfully. Although emotions can get in the way of good decision making, it turns out that we need them to make decisions. People with damage to their emotional systems (through accident or surgery) don’t become the rational optimisers of financial theory (known as homo economicus). They usually become incapable of making decisions. Instead they make lots of plans that they don’t implement. James quotes an experiment involving a coin toss. Subjects could bet $1 on a toss, and win $2.50 if tails came up. A rational subject would play this game on every round, since the expected return is $1.25. But in fact, normal subjects play only 63% of the time, whereas as those with damage to their fear circuits play 85% of the time. 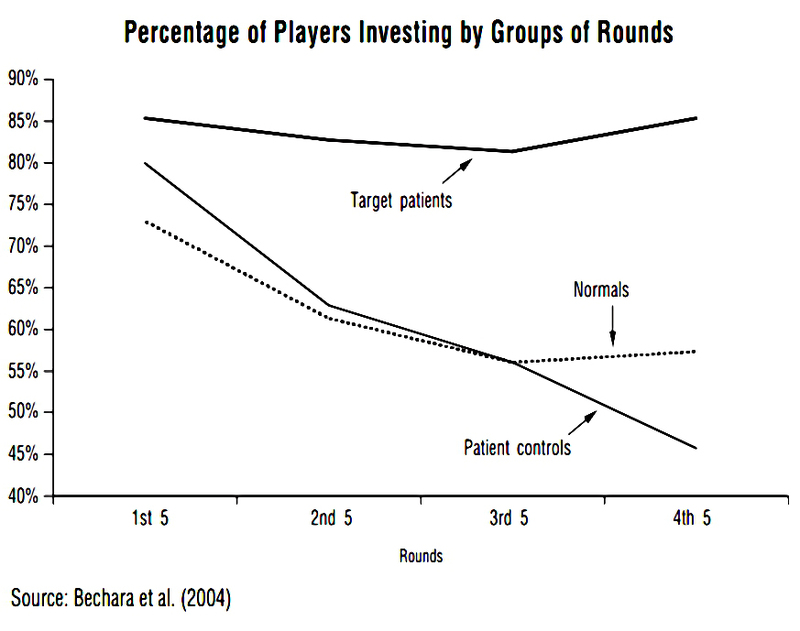 Normals played less after losing on a previous round, but no fear subjects weren’t affected. with too much emotion we can’t control the fear that risk produces (and turn down rational investment choices). And finally, James notes that when in a “cold” emotional state, we are unable to predict how we will feel in a “hot” emotional state. The classic experiment here involves male students describing their likely behaviour in a scenario (coming home with an “easy” girl they had picked up in a bar). After being shown sexually arousing photos, the probability of sexual aggression rose from 56% to 80%. 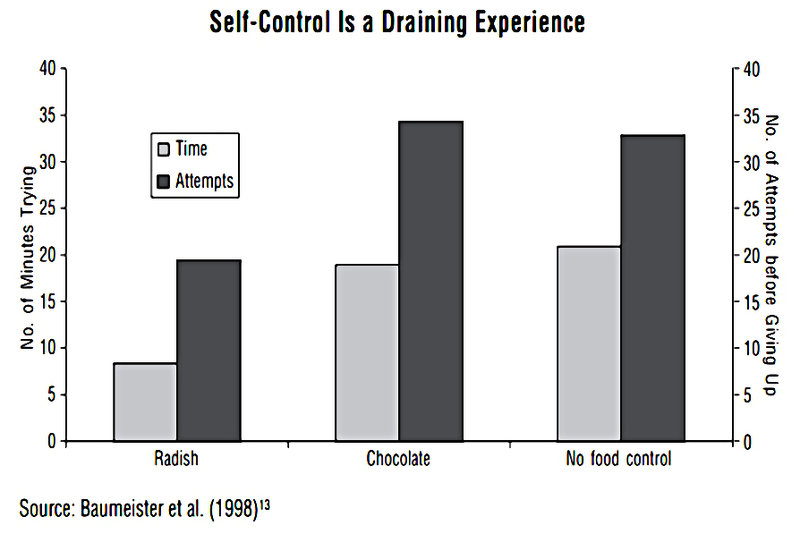 Our self-control is limited – each effort reduces subsequent capacity. James quotes an experiment where subjects were told to fast for three hours (skip lunch) then taken to a room with trays of freshly basked cookies and radishes. One group was allowed to eat cookies, and another only radishes. A third group was taken to an empty room. All three groups were then asked to trace geometric shapes without lifting their pen from the paper, or covering a line twice. The problems were impossible, but the subjects who ate the radishes had used up their self-control, and gave up much more quickly. 1. Under emotional distress, people shift toward favoring high- risk, high payoff options, even if these are objectively poor choices. 2. When self-esteem is threatened, people become upset and lose self-control. People with a high opinion of themselves are in a hurry to demonstrate how great they are. 3. When self-regulation fails, people become self-defeating and short-termist, no longer able to delay gratification. 4. Self-regulation is a limited resource like strength or energy and runs out as decisions and choices are made. Subsequent decisions may be costly or foolish. 5. The need to belong is a central human motivation, and rejection leads to irrational and self-defeating acts. Thus, for example, an underperforming asset manager will be under pressure to try high-risk, high-reward short-term options in order to catch up. But there is hope, since our brains are “plastic” – they are able to change. We can learn to be better. The more we use a particular brain pathway, the thicker it gets. We can grow ourselves a better brain. Of course, this also means that bad habits become ingrained. So the best approach is to avoid them in the first place. James suggests that the best way to do this is to become aware of heuristics and biases. We all have biases, though we are likely to rate ourselves as suffering less from them than the general population. James runs through the ten most important biases in turn. are you an above-average driver? are you above average as a lover? Almost everybody thinks that they are. Overconfidence and overoptimism are very common, and they stem from the illusion of control and the illusion of knowledge. People believe that their forecasts improve with more information, but they don’t. The classic study involves bookmakers being given more and more information about horses. The more information they had, the more confidence they had in their forecasts. But the accuracy of the forecasts didn’t improve – five pices of information were as useful as forty. 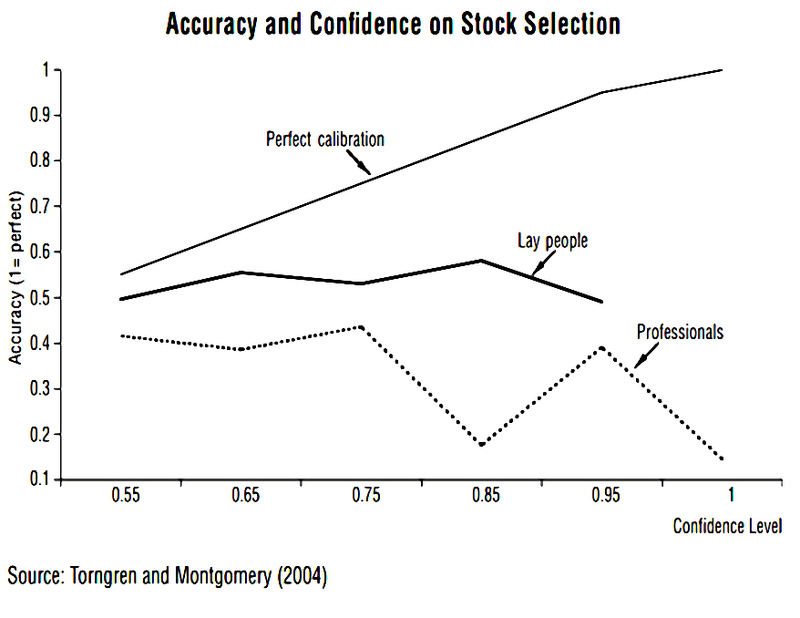 The next study applies the same principles to stock-picking, and compares professionals to amateurs (psychology students, as so often in psychological studies). Both groups were worse than random. When professionals were 100% sure they were correct, they were actually right less than 15% percent of the time. 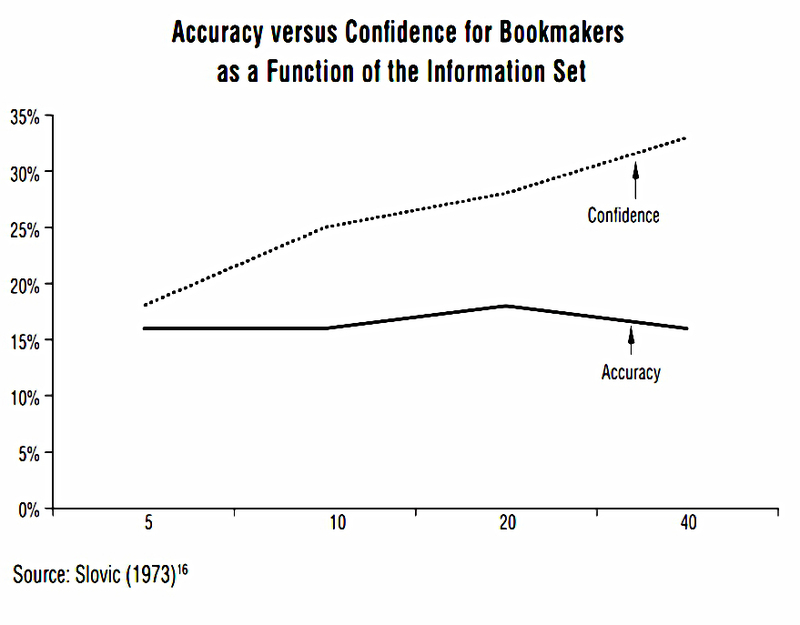 Experts are actually likely to be more overconfident than amateurs. Now back to the illusion of control. People think they can control things about the world that they can’t. James begins with lottery players, who will pay more than four times the amount for a ticket where they can choose their “lucky” numbers. And people prefer to bet on a coin toss before the coin is in the air, as if they can influence the outcome. More information makes the illusion of control stronger. Information can be judged along two dimensions – strength and weight. Confusing these leads to over- and under-reaction. this has strength, but no weight. Such information tends to produce over-reaction. Whereas high low strength and high weight tends to produce underreaction. For example, investors under-react to changes in dividend policy (high weight). 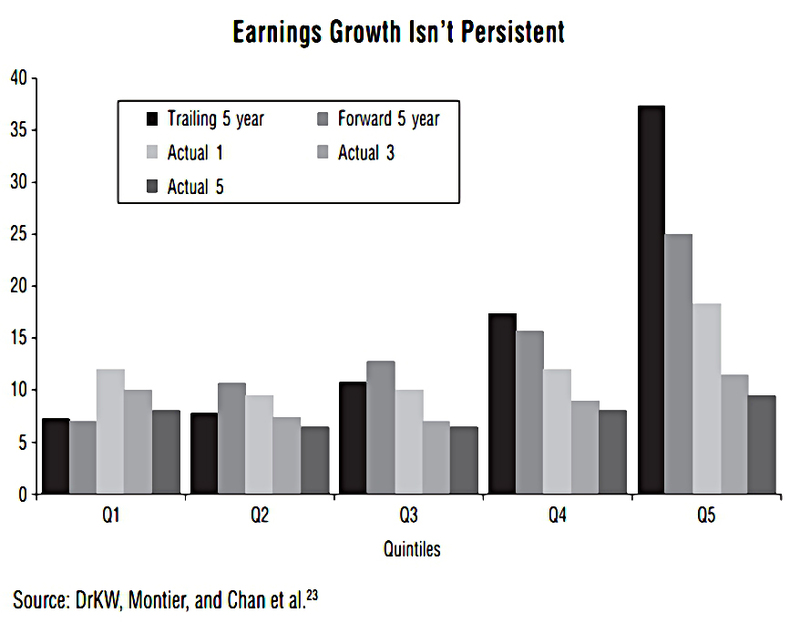 And they over-react to historically high earnings growth, rather than focusing on the firm’s likely future prospects. There are four cards on a table: E, 4, K, 7. If a card has a vowel on one side, it has an even number on the other. Which card(s) do you need to turn over to test this? Most people choose E and 4. But finding that 4 doesn’t match with a vowel wouldn’t prove anything. James explains this as part of confirmatory bias – looking for information that agrees with us. We should really be looking for information that proves we are wrong. This is also known as the scientific method. Related to this is the very topical hostile media bias. When we find information that disagrees with us, we view the source as biased. 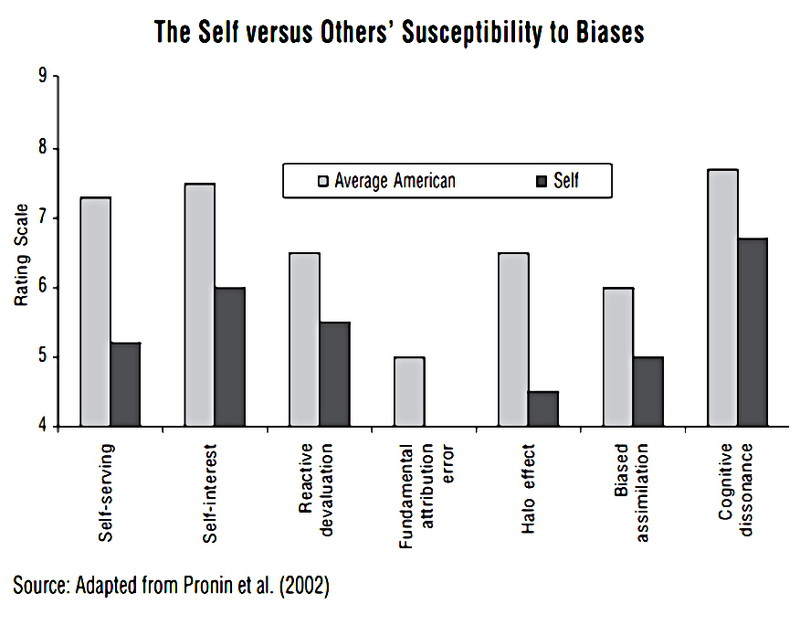 To protect our self-esteem we use the self-attribution bias. 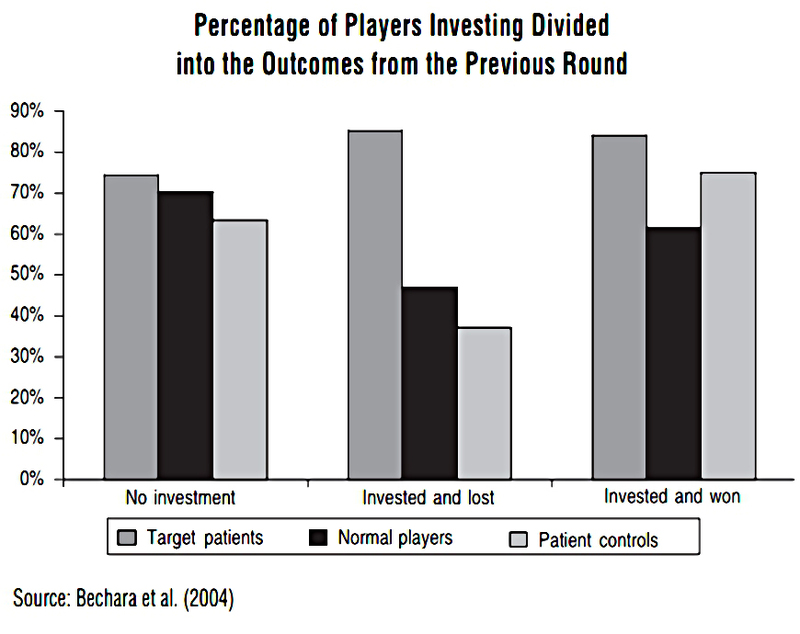 Good outcomes are down to skill and bad ones to luck. This prevents us from recognising our mistakes and learning from them. We need to be clear about when we are “right for the right reason” rather than “right for some spurious reason”. This means we need to keep an investment diary, and record the reasons for our trades. This is hindsight bias – we rewrite the past to fit our current understanding. For example, everybody claims to have spotted the bubbles that they denied were forming at the time. And this bias leads to overconfidence. Faced with uncertainty, people lean on the irrelevant. The classic study asked subjects what percentage of the UN was comprised of the African nations . Before answering, a wheel of numbers was spun. Answers clustered around the number that showed up (always 10 or 65). This is known as anchoring. Any irrelevent number will be factored into your view or the world, or of the future. 8 × 7 × 6 × 5 × 4 × 3 × 2 × 1 gives 2,250. People anchor on the early numbers (but still get it wrong – the right answer is 40,320). Estate agents have also been shown to value houses close to the estimate they are initially provided with. And people have been shown to value objects at prices close to the last two digits of their social security number. In investing, common anchors are the current price and the price you bought in at. For example, analysts’ price targets are usually close to the market price. what does the current price imply for future growth? is this growth likely to be delivered? 31, single, outspoken, and very bright. She majored in philosophy at her university, and as a student was deeply concerned with issues surrounding equality and discrimination. Many people choose the second option, which can’t be true (it’s a subset of the first). They are choosing on the basis of how things look. This is the representativeness bias. In investment, people think that good companies must make good investments, and that historic earning growth will persist (in fact it is highly mean-reverting). Which means that a cheap low-growth company may really be the better investment. We think of our memories as perfect, but they aren’t. People are more likely to recall vivid, well-publicized, or recent information. So one bias here is the recency effect, and another is a preference for personal experience over that of others, or of real data. This is probably because of the emotion generated by personal experience. Overweight the importance of unlikely events that have occurred to them, and to underestimate the importance of those that have not. As well as things that happened to us, we overweight things that are easy to remember, or get more media coverage. So people think sharks kill more Americans than lightning, though lightning actually kills 30 times as many. James points out that pigs and coconuts kill more people than sharks. Another example is that people think that more words begin with k than have k in third place (because we recall words by using their first letter). The next bias is about framing, and James uses a virus outbreak affecting 600 people to illustrate. A – 200 people will be saved. B – there is a 1/3 probability that 600 people will be saved and a 2/3 probability that no-one will be saved. Plan B has an expected return of 200, the same as Plan A, but less risk. So 72% of people choose A. C – 400 will die. D – there is 1/3 a probability that nobody will die, and 2/3 probability that 600 will die. Now both plans have an expected return of 400 deaths, and C has less risk. But only 22% choose C.
Of course A = C and B = D.
The only difference is the framing. A vs B makes people feel they are saving people, and they want to be certain they will. C vs D make people feel they are killing people, and they want the chance to avoid this. James next moves to inattentional blindness, which is when people fail to notice things when they are preoccupied. The classic test involves counting basketball passes in a video. 46% of people don’t notice a guy in a gorilla suit walking through frame (and beating his chest). James uses the example of share buybacks to illustrate investor inattention. Investors are told that buy-backs have replaced dividends (in the US). And net buybacks (after adding in share options) are only 19% of announced buybacks. Buybacks add only 0.76% to yield (making it 2.4% overall). I don’t think this is a great example, though it’s obviously true, as it was news to me. This is my own personal bias. This one is about the endowment bias. We like things better when we already own them. Humans are attachment machines, which is great when you have a baby or a pet, but not so great with stocks and stuff (think hoarding). James begins with a bottle of wine you bought for $15 a few years ago, now worth $150 at auction. This is actually the status quo bias, which is part of the endowment effect. The status quo bias and the endowment effect are part of loss aversion. People worry about gains and losses more than absolute prices. And they dislike losses far more than they like gains. James often asks people how much they would need to win on a correct coin toss guess if they would lose £100 if they were wrong. The average response is more than the “logical” £200. This is another reason people hang onto their losers and cut their winners, and has been called the disposition effect. One study found that people held losing stocks for 124 days but winners for only 102 days. They sold 15% of winning positions and only 9% of losers (a ratio of 1.7 times). Sadly, the sold winners outperformed the held losers by 3.4% pa. The same researcher found that 54% of mutual fund purchases were of fund in the top 20% of past performers. Yet only 14% of sales were in the bottom 20% of performers. Investors were 2.5 times more likely to sell a winning fund than a losing one. Professional investors think they are above all this, but in fact they only a little better. 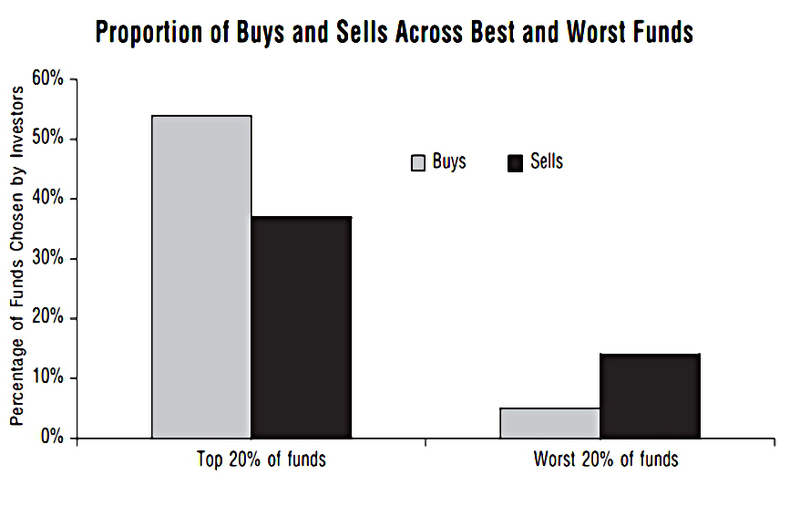 Fund managers are 1.2 times more likely to sell a winner than a loser. 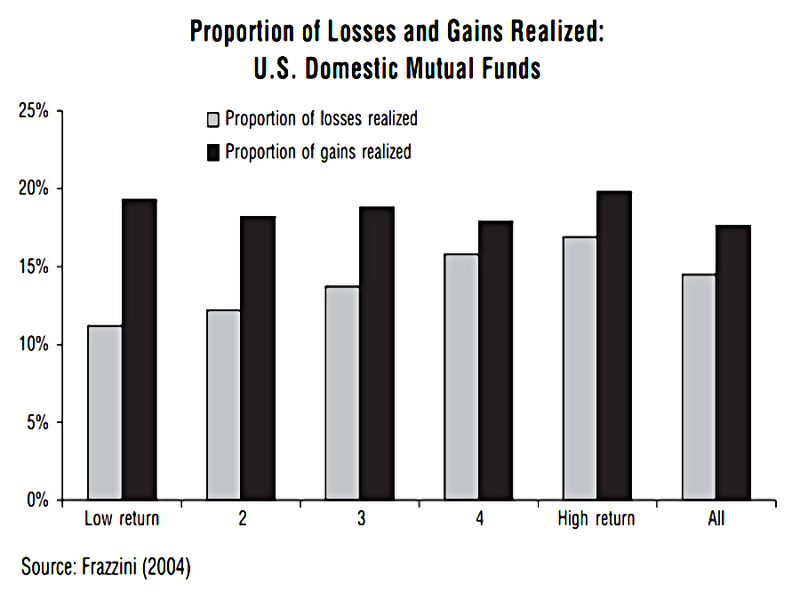 The best performing funds are those that sell the most losers. But this book chapter is perhaps the most concentrated introduction to behavioural finance that I’ve yet seen. 1 – These biases apply to everyone. 2 – You know less than you think you do. 3 – Focus on facts, not stories. 4 – More information doesn’t equal better. 5 – Is a piece of information is high strength / low weight, or low strength / high weight. 6 – Look for information that disagrees with you. 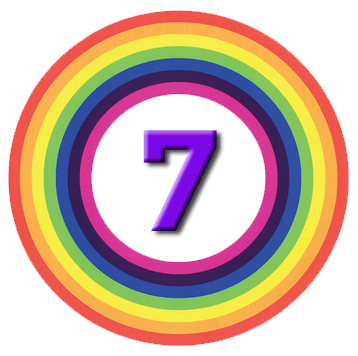 7 – Your failures aren’t bad luck – examine your mistakes in order to improve performance. 8 – You didn’t know it all along, you just think you did. 9 – If you can’t debias, then rebias – use a sensible valuation framework. 10 – Judge things by how likely they are, not how they appear. 11 – Don’t overweight personal experience. 12 – Big, vivid, easy to recall events are less likely than you think. 13 – Don’t take information at face value – think about how it was presented to you. 14 – Don’t value something more because you own it. 15 – Sell your losers and ride your winners. Very informative read! As you say, knowing what you are thinking and knowing why you might favor a certain decision are key to getting better at many tasks, including investing. 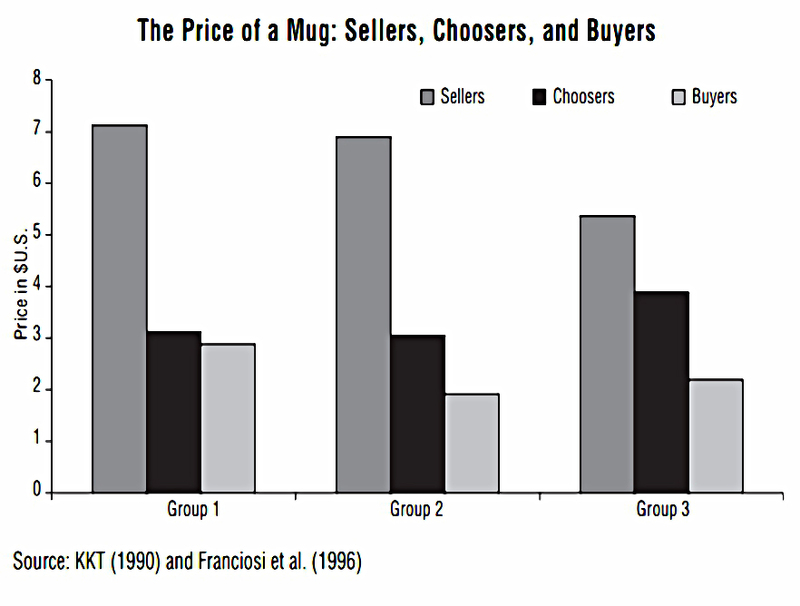 Understanding heuristics will definitely help one make more rational decisions. But knowing about heuristics in a cold state is different than applying that knowledge in a hot, emotional state. This is where I think meditation, which leads to mindfulness, can help us recognize when we are acting emotionally and to our own disadvantage. I’ve devoted a whole website to mindful investing for just this reason.